It's fun to explore a new bit of water, but while learning how to fish it, don't expect great catches every time. David Harris and I went to Quarry Lakes in early August to check the fishing. Our strategy was to try various tactics until we found what the fish liked. It turned out that we got hits at about twenty feet down in seventy-foot deep water. The flies illustrating this article are what the fish bit. I was eager to go back. Our next visit was a week later. We fished from 8AM to 5PM, with an hour-and-a-half break at 1PM. In the morning session I fished especially hard with the flies that I had tied that matched what we had gotten strikes on the previous Friday. Not a hit all morning, although fish were jumping all day long. In the afternoon the wind came up and made fishing very tough. It became very hard to fin against the white caps, but we stuck with it 'till 5PM. I switched to a very large surface fly and tried to get one of the jumpers to take it. Still nothing doing. We both got skunked, but the day was not a complete bust for me because I completed a project that I should have done years ago. I was using two different types of sinking lineundefinedan intermediate sink and a sink-tip. I had a water-proof marker with me. Neither line had ever been marked every ten feet, so I couldn't tell if I was letting out the same amount of line each time after catching a fish or getting a hit. So while I was on the water I marked my intermediate sink line with the following system. At ten feet I put a half-inch long black mark around the line; at twenty feet two half-inch black marks separated by about a quarter of an inch. I kept adding marks like this to fort feet. At fifty feet I put in a solid one-inch line. At sixty feet I put in another mark as long as the fifty-foot mark plus one half-inch mark. By the time I got to eighty feet I was using one large mark and three short ones. After putting these marks on the line and giving them time to dry I then got back to fishing which now became more precise. I would let out thirty feet and fish for a while , then forty, fifty, et cetera, until the whole line had been let out fishing for a while at each depth. Marks this big can be seen well from a distance so you can tell when a certain amount of line is at your rod tip. During our lunch, I did the same thing to my sink-tip line. This is something I plan to do on all my sinking lines so I will be able to tell more precisely at what depth I got my strikes or caught my fish. In this way my outing was not a complete bust. I still had fun although I didn't catch a fish. 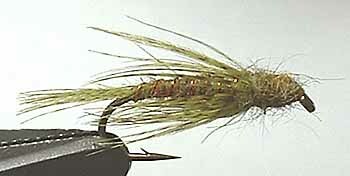 I tried about eight different patterns without any luckundefinedfrom small flies to very large. I don't know what else to tell you except that these things happen. When they do, you cannot get discouraged. That's why they call our sport "fishing" not "catching". Quarry Lakes Park is across the bay in Fremont. Go across 92 to 880, then go south to Decoto Rd. Follow that east 'till Paseo Padre Parkway. Turn right and go a few blocks to Isherwood Way. Turn left and go about a quarter-mile and you will see the entrance on your right. Parking $4/day, float tube $2/day, fishing permit $6/day for an amount of $16 for 2 to fish out of float tubes. Bring lunch and plenty to drink, as it can get hot. I stayed cool in the float tube and my heart rate stayed in the 50–62 range, which was great. There are nice shade areas to have lunch and cool down right off the parking lot. On the main lake you can back your car down the boat launch to drop your gear off right at the water's edge. One person would have to drive back and park while the other stays with the gear. Then you are ready to wet your lines. From the boat ramp, go out to your left about one-hundred feet, then fin your way towards the point of the peninsula that sticks out into the lake. It was between this area where David Harris and I got hits on the first outing. City of Fremont Quarry Lakes page. Directions, hours, fees, facilities, allowed activities, rules. East Bay Regional Parks District Quarry Lakes page. Directions, hours, fees, facilities, allowed activities, rules, with a good map of the layout and facilities at the bottom of the page.